"Flexibility ... that's the most important part of my job," Shaker Heights Planning Director Joyce Braverman told me. 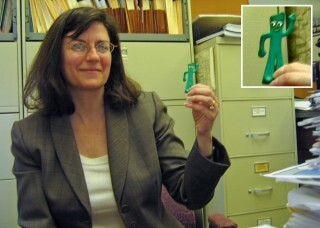 She even carries a small reminder of this in her purse, the world famous -- and very flexible -- Gumby. As Braverman peered out over stacks of maps and reports, I asked her what her job in this inner-ring Cleveland suburb involved. She ticked off a long list of "to do's": working on the Shaker Town Center redevelopment project; seeking funding for a major transit-oriented development plan at a key intersection; attending numerous public meetings; staffing an active planning commission and architectural review board; coordinating with the City's separate housing and economic development departments; dealing with a growing number of foreclosed homes; and "doing a lot of grant writing." You need to be flexible to handle such a diverse assortment of tasks. The Cleveland inner suburb of Shaker Heights includes a wide range of housing types. Flexibility also is a good way of thinking about Shaker Heights. I say that because Shaker provides its residents a considerable amount of flexibility in their housing choices. You'll find a very wide range of housing types and housing prices in this suburb of 27,245. About 40% of the housing stock consists of two-family homes and apartments. At the other end of the spectrum, you'll find no shortage of million dollar homes. Historically, Shaker Heights as a community has pro-actively sought to maintain a mix of housing and, as a result, a mix of incomes and ethnic backgrounds. "Diversity helps make a place," Braverman noted. Years ago, Shaker Heights even had a city department titled "the Department of Pro-Integration" -- sending out a message that Shaker wanted to be an racially integrated community. This viewpoint is still reflected in city policy and programs, and in community attitudes. For example, since 1986 the non-profit "Fund for the Future of Shaker Heights" has provided home loans for owner-occupied housing "in areas in which the purchasers will enhance the racial diversity of the neighborhood." The Fund matches up to 10% of the purchase price up to a maximum of $18,000. Census data for 2000 shows that Shaker Heights has remained integrated, with 61.7% white population, and 34.5% African-American. There has also been a growing proportion of Asian and Hispanic residents, though the total is still relatively small (for example, the Asian population grew from 1.9% to 3.8% between 1990 and 2000). Interestingly, Shaker Heights' diversity is part of what attracts quite a few people to the community, including those who work at the nearby Cleveland Clinic and Case-Western Reserve University. In fact, my sister-in-law, Cheri Shapero (a Shaker Heights resident) handed me a copy of the April/May issue of Shaker Life Magazine* which featured articles on "Shaker's International Flair," highlighting why families from Lebanon, India, the Netherlands, and Serbia chose Shaker Heights as their new hometown. In reading through the articles, it also struck me how diversity, when paired with high quality public schools and an attractive, walkable environment, seemed to especially resonate with those from abroad. 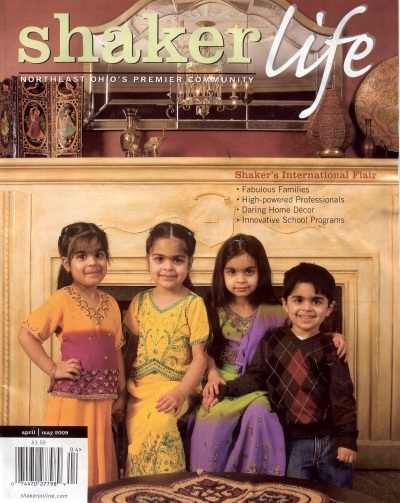 * yes, Shaker Heights even has its own magazine, published by the City's Communications & Outreach Department and distributed free every other month to all Shaker Heights residents.